The two top officials in charge of security and toxic-waste cleanups at the Environmental Protection Agency have abruptly left their jobs, days after EPA administrator Scott Pruitt told lawmakers that his subordinates were to blame for alleged ethical lapses that have prompted more than a dozen federal investigations of the agency. 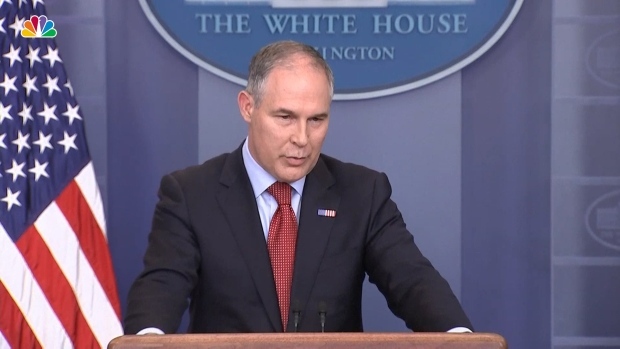 In statements Tuesday, Pruitt praised the two men — security chief Pasquale "Nino" Perrotta and Albert Kelly, a former Oklahoma banker who ran the EPA's Superfund program — and gave no reason for their unexpected departures. Perrotta is due to appear Wednesday for a transcribed interview by staffers of the House Oversight Committee, one of the congressional bodies and federal agencies that are probing reported excessive spending by Pruitt and other issues at the agency. Committee aides said Perrotta's resignation was not expected to derail his appearance. EPA spokespeople Jahan Wilcox said the two men's departures were unrelated to the ongoing federal investigations, and said the agency was fully cooperating with the congressional probe, led by House Oversight Chairman Rep. Trey Gowdy, a South Carolina Republican. Pruitt's spending on security, and some of the security contracts with Perrotta, are among the topics of the federal probes involving the EPA under Pruitt, a former Oklahoma attorney general. Pruitt, an ardent advocate of minimizing regulation who moves in conservative political circles, evangelical Christian ones, and business groups, has survived the kind of scandals that have brought down several other Cabinet appointees of President Donald Trump. On Tuesday, The Washington Post reported that a Pruitt trip to Morocco last December was partly arranged by a longtime friend and lobbyist, Richard Smotkin, who last month received a $40,000-a-month contract with the Moroccan government to promote its cultural and economic interests. The trip, which has drawn scrutiny from federal watchdogs, cost more than $100,000, more than twice the amount previously estimated, the Post said. 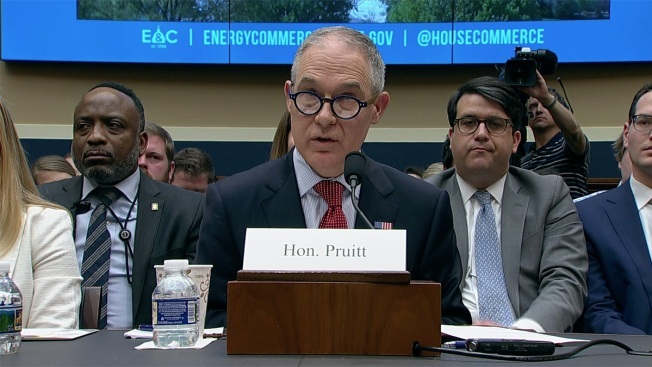 At House hearings last week, Pruitt weathered six hours of scathing questions, criticism, and a couple calls from congressional Democrat to resign over the steady flow of news reports and announcements of new investigations involving alleged ethical lapses at his agency. They include spending on Pruitt's behalf for round-the-clock security guards, first-class plane tickets, and a $43,000 soundproof telephone booth. Pruitt repeatedly deflected blame last week, describing subordinates as going too far in carrying out their duties, in excesses that occurred without his knowledge. In the case of the $43,000 booth, for example, Pruitt acknowledged to lawmakers he had asked for a private and secure phone line when he arrived at the agency, but said staffers took it upon themselves to spend tens of thousands of dollars in providing it. It was security officials, not Pruitt, who decided he should fly first-class, he said. Pruitt pledged last week to take care of the problems. "Ultimately, as the administrator of the EPA, the responsibility of identifying and making necessary changes rests with me and no one else," Pruitt told lawmakers then. Notably, most Republican lawmakers at the hearings declined to join the Democratic dog-pile on Pruitt. It was unclear Tuesday whether lawmakers from Pruitt's majority party would take the internal shake-up as a needed and promised house-cleaning by Pruitt or indication of even greater trouble at the agency. "I don't know how to take this, yet," Rep. Ryan Costello of Pennsylvania, one of the few Republican lawmakers last week to fault Pruitt on expenditures such as taking bodyguards with him to Disneyland and the Rose Bowl, said in a statement by email. "I'm waiting on more details ...to shed more light on what, if anything, to make of it." Pruitt said in his statements that Perrotta was retiring after a 23-year government career that included time in the Secret Service and under previous EPA administrators. He praised Perrotta for hard work and dedication. Pruitt thanked Kelly for what he said was his "tremendous impact" in Kelly's year overseeing the nation's Superfund program, charged with handling the cleanup of toxic waste sites. Pruitt hired Kelly, an Oklahoma banker, at the EPA after federal banking regulators banned the man from banking for life. Regulators have not publicly specified the actions that led to the banking ban. . Days ago, Rep. Scott Peters, D-Calif., pressed Pruitt for more details about why exactly Kelly had been sanctioned by regulators. Scott Pruitt, then-director of the Environmental Protection Agency, talked about plans to ease emissions standards for cars and trucks at a press event in April. Regulators said a timeline put in place by President Barack Obama was not appropriate and set standards "too high." "I think Mr. Kelly, if he's willing to share that with you, he should do that," Pruitt said Thursday. The Federal Deposit Insurance Corporation, believing Kelly "violated a law or regulation," a year ago fined him $125,000. The undisclosed incident involved a loan by SpiritBank — which Kelly's family has owned for generations — allegedly made without FDIC approval. Democrats in Congress also are asking for federal investigations of Kelly's reported loans to Pruitt himself while the two were still in Oklahoma. Kelly is not among the EPA officials whom the House Oversight Committee members had summoned for questioning. Rep. Don Beyer, a Virginia Democrat who has been one of those pushing for more federal probes into newspaper reports of ethical problems under Pruitt, said in a statement Tuesday that "Pruitt should be the next to go." "Albert Kelly was never qualified to run Superfund, his banking ban was a huge red flag, and his resignation is a positive development," Beyer said. Separately, three House Democrats raised new allegations Tuesday that staffers working on Pruitt's behalf in early 2017 looked into the possibility of opening an EPA office in Tulsa, a city of 400,0000 and Pruitt's home. They provided no supporting documentation. Neither EPA spokesmen nor any of the people supposed to have knowledge of the alleged request could be reached for comment at the close of the business day, when the Democrats' letter with the allegations was released. Pruitt has drawn criticism for frequent trips home to Tulsa at taxpayer expense.